t took a wine village to bring focus on the happy fact that things are generally on an upward trajectory for the still-young Indian wine industry. 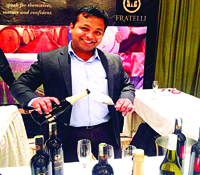 The Indian Wine Village is the Bangalore Wine Cluba��s annual soirA�e showcasing Indian wine, and was held last weekend in The Taj West End ballroom. 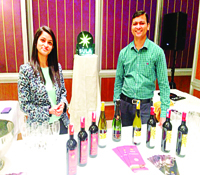 Eleven leading Indian wine companies participated, showcasing 72 labels, some award-winning, to 100 members and their guests, who moved from stall to stall sipping the wines on offer a�� sparkling, white, red and pink. The Bangalore Wine Club has been the first Indian wine club to launch this format and ita��s now a fixture on the cluba��s annual agenda as part of the cluba��s commitment to support our own Indian wine industry. Saturday afternoon, glass of wine in hand, I wandered from stall to stall soaking in the festive atmosphere. Besides tasting from the established and new wine companies, I also caught up with some of the young men and women who have decided that wine is their career path of choice. Antara Kini, training and trade marketing manager for Grover Zampa Vineyards, who was busy pouring flutes of their sparkling wine said she knew very little about wine growing up, but a stint with a training company made her passionate about the subject. a�?Yes, the wine trade in India is a challenging job, but ita��s so rewarding when I get positive feedback about our wines being up to international standards.a�? V Natarajan, committee member and former president of the club agreed. a�?Ita��s an excellent platform for our members to taste, share their thoughts on wines, and very heartening to see people from wine companies discussing one anothersa�� wines.a�? 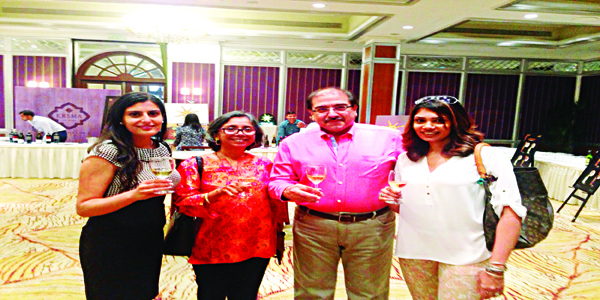 Indeed, not just the young execs, but wine company owners like Krishna and Uma Chigurupati of KRSMA Estates and Shambhavi Hingorani of SDU Winery were seen mingling, chatting and sipping along with the members. 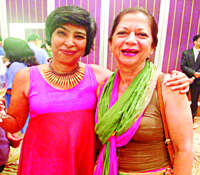 Have Indian wine drinkers changed their attitude towards Indian wines? I asked Biren Ghose, committee member. a�?Therea��s a distinct openness among the members now to try new Indian wines, even look actively for new releasesa��a change from earlier attitudes which were somewhat dismissive,a�? he admitted, a�?This year, I found that almost everyone found something in the array of wines to appreciate. In a market where brands are struggling for shelf space, this helps builds brands and is a very strategic thing the club is doing.a�? BWC founder member and wine consultant Alok Chandra, who was concentrating on tasting the reserve wines there that day, said he found the wine village concept a�?invaluablea�� to foster knowledge and understanding of Indian wines. a�?Most consumers dona��t get the opportunity to sample so many wines,a�? he said. a�?Certainly, consumers have also come a long way since the first few times the wine village was held. Some Indian wines are now very good and getting better. The whole concept also resonates with the current a�?Make in Indiaa�� drive thata��s on.a�? Wea��ll raise a toast to that.